This post has been appended with additional information. In the wake of Sunday’s killings in Colorado, Chuck Chadwick’s phone has been ringing steadily. In between calls from reporters, there’s the occasional church calling to find out how to beef up security. That’s the former cop’s job now, as head of security for one of the largest churches in Texas, and owner of a company, National Association of Church Security & Safety Management, that advises churches. At Living Word Church in Brooklyn Center, a megachurch that boasts 8,000 members, I was referred to the “security department,” which at least told me they had one. “We’ve got it covered, but that’s all I’m going to say,” said the man in charge of security. A Star Tribune article today suggested local Catholics are at least thinking about it. Churches and guns have been an uncomfortable mix in Minnesota. A couple of years ago, an Edina church challenged the law allowing people to bring guns to church unless a sign (above) specifically banned them. 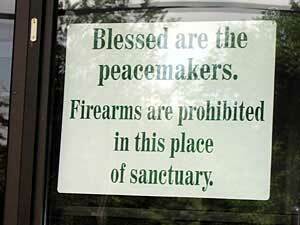 A judge agreed in a 2006 order, but churches may not ban guns from their parking lots. Update Weds 7:52 a.m. – Fargo Forum newspaper surveys churches in its area on the subject. Update Weds 10:02 a.m. – Tom MacNally, the chief operating officer at Mt. Olivet Lutheran Church, the largest Lutheran church in the region with 13,000 members, says the church has four police officers handling traffic, who also are available once worship service begins. But “if someone comes in with a rifle, we don’t have a procedure for that,” he said. The church, however, has established a lockdown procedure. In fact, MacNally says, the signs describing a lockdown process are being put up today. He says the church did not get involved in the challenge of the concealed carry law because church officials were sensitive to being involved in a political stand on the issue, and because posting against handguns would have required the church to check all of those attending church to be sure they weren’t carrying a gun. While places of worship are normally declared ‘gun-free’ zones, just like schools and many other public spaces, malls, etc., this episode may break the ice by initiating discussion of policy changes that focus on protection of the public and how best to limit the carnage caused by deranged lunatics wielding guns. Look at the recent killings across the country and note that virtually all of them have taken place in ‘gun-free’ zones. ‘Gun-free’ zones do not protect people! All they do is make people sitting ducks for these crazed killers, who walk in boldly and begin mowing defenseless, unarmed people down. And, don’t suggest the ‘banning all guns’ approach which only compounds the problem by allowing only the criminals to own/carry/or possess guns, while the law-abiding public remains defenseless; that’s the reality of gun bans. A lesson I learned many, many years ago, is that when someone starts shooting, I don’t want to be the one cowering without a gun! Bravo, and congratulations to Jeanne Assam, the security guard who likely saved many lives in Colorado. When you have thousands of strangers in a large space there’s always the potential for mass shooting. I’m surprised they don’t screen for guns at the State Fair, the Megamall, or the Metrodome (maybe they do, I haven’t ever been in it). The risk of scaring away customers is a greater negative than the the likelihood of a shooting incident. Security is driven mostly by insurance liability concerns. Just how many crazed gunmen have there been, in churches, schools, or otherwise? So few that when this happens it makes national headlines. If this happened every day like suicide bombers it would fade into the background noise. What’s next, metal detectors and an armed guard at the Pearly Gates? Isn’t it great to pull a couple quotes from the “GREAT BOOK” and use them to mean what you want them to mean to make your point. Too bad there weren’t any guns back then or perhaps we would have more to go on. We can probably cite dueling Scripture on this particular case, but it’s probably time for the opponents of, say, concealed carry to acknowledge the obvious (even if the guy offed himself, frankly), a woman with a gun saved lives. Where does that leave us? Well, first, both sides have to acknowledge their area of agreement… no one wants mass murder, or any kind of murder. And try to work from there. There are, I think it’s safe to say, times when the realities of the situation have to be recognized. Sometimes, that which some find objectionable on a theoretical basis, has an exception in the practical world. When a guy walks into a church with an assault rifle, ready to commit mass murder, is that the time to live the interpretations of what we may have been taught in our religious upbringing or to stop mass murder? And if those two things collide, whose lives are you willing to sacrifice to live that faith? Folks who’ve been reading my stuff for a long time know where I am on this… feeling alone because things aren’t always black and white to me.